An actress and comedian, Anjelah Johnson rose to prominence after starring in the thirteenth season of MADtv. In the years since, she has appeared in a number of other shows such as Comedy Central, Ugly Betty and Lopez Tonight. As an actress, she has also worked on various films, some of which include Our Family Wedding, Moms’ Night Out and The Resurrection of Gavin Stone. Outside of television, she has also released a couple of comedy albums—Gold Plated Dreams and The Come Up. In 2015, she starred in a stand-up special titled, Anjelah Johnson: Not Fancy, which premiered on Netflix. How successful is she in the entertainment industry? How well-off is she? How much does she make from her gigs? According to various sites, Anjelah Johnson has amassed a net worth of $500,000 as of 2018. What contributes the most to her income? Let’s have a closer look at her career below. How did Anjelah Johnson Make Her Money & Wealth? Born on May 14, 1982, in California, Anjelah Johnson grew up in San Jose, where she was involved with many activities including soccer, softball, track, and cheerleading. By the time she was in high school, she had also begun to act, with a particular interest in imitating different accents. Upon graduating, she went to De Anza College, where she majored in speech communications. Not long afterward, she became a cheerleader for the Oakland Raiders. Encouraged by a friend, she eventually moved to Los Angeles to pursue a comedy career in 2005. Honing her skills with improv classes, she later began to headline her own shows. Before long, her stand-up routine had begun to garner attention on YouTube. By 2007, she had landed a role in the popular sketch comedy series, MADtv. For her work on the show, she received an ALMA Award nomination for Outstanding Female Performance in 2008. Since then, Johnson has been featured in several other television titles including The Movie Preview Awards, Ugly Betty and Lopez Tonight. At one point in 2009, she was even given her own one-hour special on Comedy Central titled, Anjelah Johnson: That’s How We Do It. Not long afterward, she was featured on George Lopez’s late night talk show, Lopez Tonight. In 2013, she released her second stand-up special, Homecoming Show on Netflix. Well received, a sequel titled, Anjelah Johnson: Not Fancy eventually premiered on the platform in 2015. Well received, it’s likely that she earned a considerable amount from the specials. In terms of other endeavors, she has also acted in several films over the years such as The Box, Our Family Wedding, Alvin and the Chipmunks: The Squeakquel and Moms’ Night Out. As a voice actress, she has appeared in the animated movies Marmaduke and The Book of Life. Most recently, she played the part of Kelly Richardson in the drama film, The Resurrection of Gavin Stone in 2017. Outside of television and film, the comedian has also come out with a couple of comedy albums titled Gold Plated Dreams and The Come Up (both as Bon Qui Qui). Yes, she has been married to Manwell Reyes, a member of the hip-hop group Group 1 Crew since 2011. Does Anjelah Johnson Have Any Children? No, she and her husband have stated that they do not wish to have children of their own. Does Anjelah Johnson Go to College? No, as far as we can tell, Anjelah Johnson has not gone to college. What is Anjelah Johnson Famous For? Anjelah Johnson is best known for her portrayal of Bon Qui Qui in the sketch comedy series MADtv. Originally from the Bay Area, Anjelah Johnson currently lives in LA with her husband. We do not have any additional information on their home at this time. What Kind of Car Does Anjelah Johnson Drive? Unfortunately, information on Anjelah Johnson’s vehicle is not available. How Much Money Did Anjelah Johnson Make Last Year? Details on Anjelah Johnson’s 2017 salary is not available at this time. 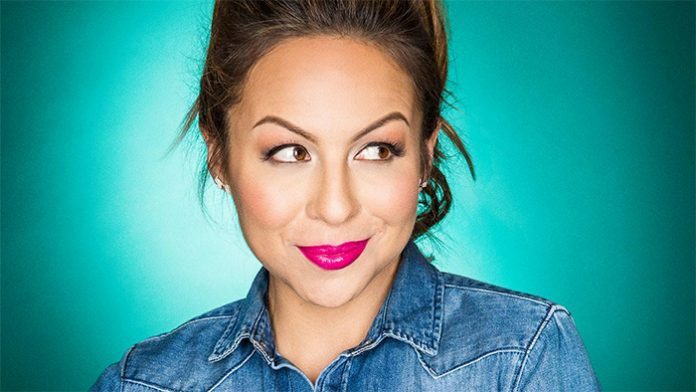 For the past few months, Anjelah Johnson has been traveling across the country for her 2018 More of Me comedy tour. In fact, she is still performing as we speak—for more information on the venues and dates, be sure to check out her official website here. Want to keep up with the comedian/actress? If so, you can also follow Anjelah Johnson on Twitter and Instagram at @AnjelahJohnson. On Facebook, she also has an official page that you can check out for the latest updates and news.